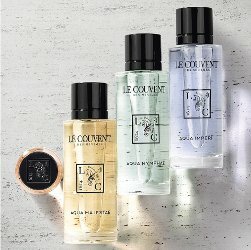 Le Couvent des Minimes has launched Aqua Majestae, Aqua Nymphae and Aqua Imperi, three new additions to their Les Colognes Botaniques collection. Earlier this year, the brand introduced Tinharé, Kythnos and Palmarola, three new additions to the Les Parfums Remarquables series. Aqua Majestae ~ "Evoking golden hours where the warm and generous light floods the Osmanthus Garden of Le Couvent des Minimes, sumptuous trees with velvety yellow flowers." Developed by perfumer Thomas Fontaine; additional notes include lemon and acacia. Aqua Nymphae ~ "A moment of delicate dreams in the Water Reeds Garden of Le Couvent des Minimes. An olfactory dream in the shade of majestic trees, where a legendary spring sleeps." Developed by perfumer Anne-Sophie Behaghel; additional notes include calamus and papyrus. Aqua Imperi ~ "An olfactory escape in the Wild Herbs Garden of Le Couvent des Minimes, tribute to an indomitable nature, where the vegetation took back its rights." Developed by perfumer Céline Ripert; additional notes include citrus, lavender and myrtle. Le Couvent des Minimes Aqua Majestae, Aqua Nymphae and Aqua Imperi are available in 10, 50 and 100 ml 'Cologne Botanique Intense'. Tinharé (not shown) ~ "...a smooth tropical languor held by sweet species of the Red Mandarin and the Golden vanilla of Bahia Islands." Developed by perfumer Éric Fracapane. Kythnos (not shown) ~ "...maquis’s perfume, savage and raw, where Vetiver and Lavander are sweeped by the dry and warm wind of Cyclades Islands." Developed by perfumer Amélie Bourgeois; additional notes include thyme. Palmarola (not shown) ~ "... hypnotic steams of jasmines melted with the sweet smell of flotted wood, sublime evocation of the white cliffs of Pontines Islands." Developed by perfumer Thomas Fontaine; additional notes include bergamot, lemon and gaiac. Le Couvent des Minimes Tinharé, Kythnos and Palmarola are available in 10, 50 and 100 ml Eau de Parfum. This was the brand that allegedly had a dupe of Guerlain SDV, right? I remember smelling it at Ulta (didn’t love it or find it a dupe, but it was a fun time reading different reviews and comparisons!). Interested in smelling new perfumes from this brand if I see them in-store! I notice Ulta isn’t the best at marketing the smaller brands it carries from time to time, which is a shame. Well, also this company got sold & so has new owners and new distribution. I don’t think they’re in the US at all. Are these sold somewhere in the US? I will have to look at Ulta–I have not been in there in a while. Ulta used to have them, but don’t think they do now. They are under new ownership & we might just have to wait. I love their ones in the black bottles much better. They’re actually pretty nice for the price. Porto Bello is delicious, my favorite so far!